One of Eau Claire's original and oldest bars, Amber Inn was established in 1881 and has been owned and operated by the same family since 1981. Enjoy happy hour specials 4-6pm Monday-Thursdays, signature homemade Bloody Marys, 10 draft taps, plus a selection of 25 specialty and domestic beers. 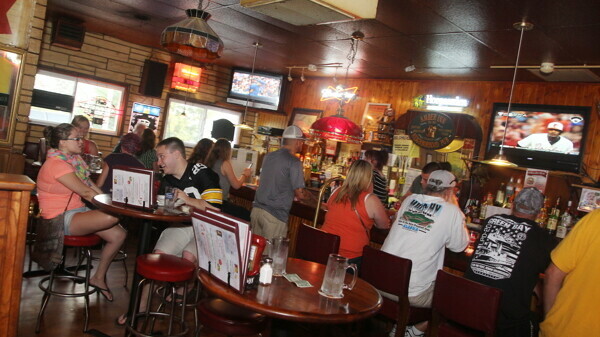 Come in and enjoy the cozy, friendly atmosphere, delicious food, and cold drinks. Free Wi-Fi, cards, cribbage board, and amusement games available. An “original” bar and grill, family owned and operated for 38 years, where the food is prepared right behind the bar, the 138-year old Amber Inn is a neighborhood favorite. Over 50 menu items, featuring famous half-pound burgers, deli sandwiches with hand-cut meats, original bar-style recipes, Thursday and Friday Fish Fry and more. Full bar, signature homemade Bloody Marys, 10 draft taps and 20+ bottled beer selection.